The «Shturman Ovtsyn» set course for the history books when it in late December left the yard of the Samsung Heavy Industries in South Korea. On 21st December, it made it through the Bering Strait and into the Chukchi Sea in a convoy escorted by nuclear-powered icebreaker «50-years Victory». Two other vessels, the heavy load carrier «Audax” and general cargo ship «Arktika-1», were also part of the convoy, Sovcomflot informs. It was tough sailing. In the East-Siberian Sea, the ships had to make it through an area of combined one-year and multi-year pack-ice. Ice conditions were very difficult, the sailors admit. On 3rd January, the ships arrived in the Gulf of Ob. While the «Audax» and «Arktika-1» docked in Sabetta, the port on the northern end of the Yamal Peninsula, the «Shturman Ovtsyn» singlehandedly proceeded deeper into the gulf to Cape Kamenny and the Novy Port oil terminal, the shipping company informs. In was a unique and unprecedented operation. Never before has such a convoy crossed through the Northern Sea Route, from the east to the west, at this time of year. However, for the «Shturman Ovtsyn» the voyage is not yet over. Figures from Marine Traffic, the online vessel finder tool, indicate that the tanker the last days of January was still located in the Gulf of Ob. So were also Sovcomflot’s two other new oil tankers, the «Shturman Albanov» and the «Shturman Malygin». 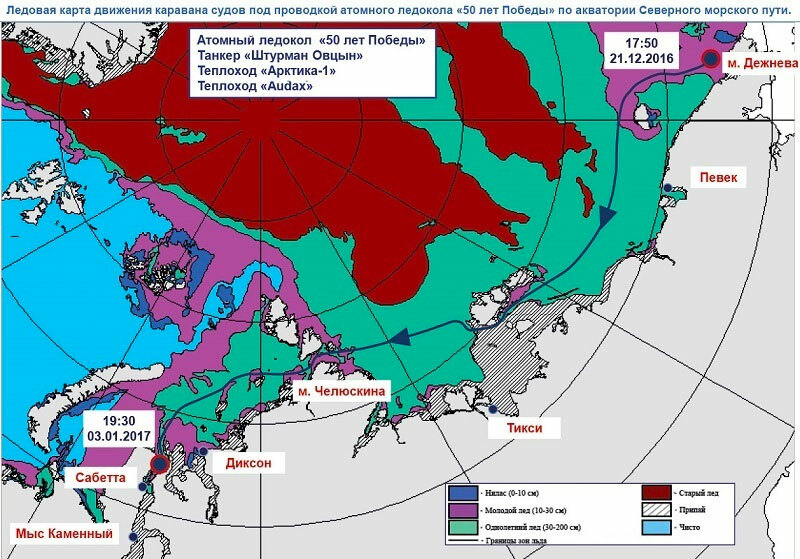 Ice data from the Russian Federal Hydrometeorology Service show that the lion’s share of the Gulf of Ob is covered by fast ice. Sovcomflot confirms that all the three tankers are now involved in shipments from the Novy Port. On 29th January, the «Shturman Albanov» picked up oil from Gazprom Neft’s Arctic Gate terminal off the coast of Cape Kamenny. That marked the first one million tons of oil shipped from the terminal. Tankers «Shturman Albanov», «Shturman Malygin» and «Shturman Ovtsyn» were all delivered to Sovcomflot in the course of 2016. Another three vessels of the kind are to be delivered to the company by Samsung Heavy Industries. They are all to be employed in shipping between the Novy Port and the Kola Bay, where the terminal tanker «Umba» is serving as transit storage point. Designed for shipping in shallow waters, the ships have a draft on only 9,8 meter and a width normal to tankers twice the size. With its aft end it is able to break through 1,8 meter of ice, and with nose part - 1,4 meters. «These tankers have no analogue in Russia», company representative Anatoly Cherner said in a presentation early 2016. «They have twice as big capacity as the tankers currently use for the purpose, and will autonomously be able to operate in the Ob Bay», he added.